Most accounts of Richard Prince’s recent legal trouble have been coloured with more than a hint of venom – as though he had, finally, gotten what he deserved. Of course, this is nothing new for Prince who has long traded (or profited, as many would argue) on the kind of controversy that his work generates. Seen by the old-guard photographic establishment as little more than a thief hiding behind the slick patter of academics, he seems to justify in every way the suspicion that contemporary art is a racket. Indeed, the specious and dismissive way he attempted to rationalise the use of Patrick Cariou’s original photographs will probably do nothing to dissuade many people of the opinion that both Prince is a cheap huckster out to make a buck. Yet all this attention being given to his methods rather than the content of those images he is so often accused of "stealing" conceals the rather inconvenient fact that his best work issues a daring set of challenges to our understanding of photography as a social currency. In dealing variously with cowboys, girlfriends and celebrities Prince reaches into the most profound archetypes of American culture, seeing how the proliferation of such images, their endless reproduction, effects how we might build a particular vision of ourselves – and how that vision inevitably becomes a commodity understood in photographic terms. He speaks for and to an age that is fully characterised by media saturation; identities are shaped by the images we consume, they perpetuate themselves in this way. His cowboys are defined by roles of traditional masculinity, which in turn are utilised to encourage the sale of a product because it is so identified with those principles – to use that product (cigarettes, in this case) is then to be cast as synonymous with that “masculine” role. Prince turns the language of advertising against itself, exposing both the thoroughness with which it is concealed and the persistence of its influence. The girlfriends too are an archetype reduced to mere commodity status, the female role defined by a nominal (male) author. Prince undermines the pernicious assumptions of this photographic trope just by showing how the trick is worked, repeating the cultural exchange that allows it to function – and the celebrities don’t even need to be explained. I mean, everyone wants to be “famous” now, right? It is the perverse insistence on appropriating overtly authored work that most gains the ire of his detractors. By comparison, no one really questions the use of anonymous press photographs in Warhol silk-screens, or even John Baldessari’s film-stills. In both cases found images are presented with minimal alteration, but this draws little comment – it is certainly not regarded as outright theft. The specific nature of an appropriation determines fair use, but the difference is more than just a conceptual one, it is also financial. 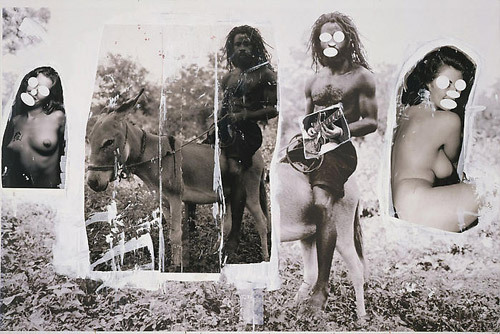 In making these works Prince significantly reduced the worth of the actual photographs by Patrick Cariou and then, most damningly, tried to refuse his culpability by denigrating them as “genre” pieces of no intrinsic value. This article offers some useful background on the case. As far as I'm concerned, appropriation is only a valid strategy when used to purposefully alter the meaning of an image. Prince's cowboys are of value in a way that Canal Zone can never be simply by the fact that he uses those images in a consciously reflexive way. This is not just a matter of changing the function of an image, but of getting inside how it works. He repeats this trick with the girlfriend series, but in many ways it is a game of diminishing returns. Canal Zone falls outside of appropriation (as I've defined it here, at least) not because of how Prince altered Cariou's photographs (considerably more than the cowboys, for example) but because the conceptual distance they travel is so negligible.